SISCO Inc.'s stock of bus plugs includes such brands as Cutler Hammer, Frank Adams, General Electric, GE, ITE, Siemens, Square D, Westinghouse, Zinsco and many more. 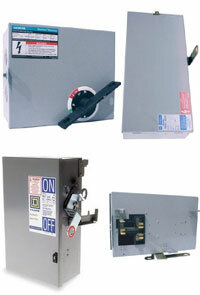 No matter what the amperage or voltage, Sisco Breakers has the fusible or breaker-type plug you're searching for. For more detailed information on our stock of bus plugs and related products, please CONTACT US with your inquiry.